Break large NSF file according to Size, Date, Year & Folder. NSF file splitter can break password protected & encrypted NSF file too. Support splitting of NSF Files for offline IBM Domino Serever. IBM Lotus Notes must be installed to split NSF file. Generate log report for comparison of files before and after split operation. NSF file splitter software successfully split all data of Lotus Notes including mailbox, archive & contacts (names.nsf) file into multiple parts in a very secure and safe manner. Reduce NSF file size if you found that large NSF file is seems to be unmanageable and hinders the fluent working. 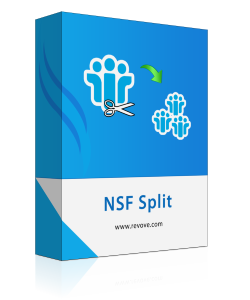 Cut NSF files into small size chunks of 30 MB to 50 GB accordingly with the help of NSF Split tool efficiently. Manage NSF File by splitting it according to the date. This option allow user to split lotus notes NSF archive & mailbox according to date just by specifying particular date. The complete NSF file gets divided into two parts one contains data before the specified date and other one contains data after that date. This Splitting option allowed trimming of NSF files according to the year range. For example if user select the year range of 2012 to 2016 then the software will create 4 NSF files one for each year separately. NSF Splitter Tool support splitting of lotus notes NSF data according to folder, here the tool will first create separate NSF file for each NSF file folder then allow to split these NSF files according to size also. For example software will create inbox.nsf for inbox folder and outbox.nsf for outbox folder respectively. NSF split software has the capability to trim the password protected and encrypted NSF file. Thus this feature makes NSF splitter as a unique tool. User need not to worry about the protected NSF files as it can handle extremely protected NSF file easily. The software perform splitting of NSF files in a manner that it will not affect the overall integrity of NSF file. All Meta data plus attachments were remain intact before and after splitting process. The software doesn't alter even a single bit of data and achieve cent percent integrity and consistency. Software support displaying of live status of splitting process and also generate log report after successful completion of operation. The Log report provide a mechanism to compare the NSF file before and after fragmenting. NSF Splitter tool provide support for any version of lotus notes including the latest one to the former versions. In short the software has no compatibility issue with any lotus notes version. NSF Split support lotus notes version 9.0, 8.0, 8.5, 7, 6 & all below versions. Support: Windows 8.1 & All below Window Version. Is this tool can split password protected NSF file? Yes, This tool can split password protected NSF file. There are so many options to choose from and each has a great benefit in making the entire procedure completely customized according to the user's requirement. I had to make a purchase immediately after testing NSF Split tool due to the great output generation.